It really was time to look for glasses suitable for a child with Down's syndrome. Yes, I admit it, I have been putting off getting Natty's first pair of glasses. I wasn't convinced by the initial hospital prescription as he reads well and can see the board at school quite happily. So we sought a second opinion and, although the prescription is slight, it was felt that Natty's eyes might get less tired if she wore glasses. She'd be able to concentrate more easily at school and will be less tired (and let's face it grumpy) at the tail end of the day. So, off we trotted, I with outdated views of what NHS glasses looked like back when I was at school and Natty excited about dressing up and trying on a variety of hilarious disguises (I expect). I guess I was also a little reluctant also to enter the world of lost and destroyed spectacles, broken frames, twisted, sat on, thrown in a ditch, left on a bus. I seems like a stress factor I could well do without! But the hubub of the holiday season was behind us, and Natty seemed keen, so bring on the glasses wearing! We chose a small independent opticians, and one where you don't have to make an appointment but simply turn up and wait to see the experienced owner. I figured this was less stressful that having to arrive at a specific time. We arrived, played with a tub of toys, and were called within 5 minutes. Natty was reluctant to leave the toys. Uho... tantrum alert! The optician was wonderful and encouraging and helped Natty lug the heavy wooden frame with coloured beads that she was so adamant she didn't want to leave, into the consulting room. Tantrum diverted. Phew! I had decided that in the name of encouraging independence Natty was to choose her own frames with the help of the optician. The lady asked her what her favourite colour was. "Sky blue pink Dame Edna style with rhinestones and glitter please. Brown!" she replied swiftly and surely with a grin. The woman lifted a pair down and offered them to Natty who put them on, caught herself in the mirror and shrieked "I LOVE IT!" Any worries I had about glasses not suiting Natty immediately melted away. It's true, specs really are cool! Even free NHS ones. All we have to do now is wait 10 days for them to be made and altered to fit, included shortening the arms. 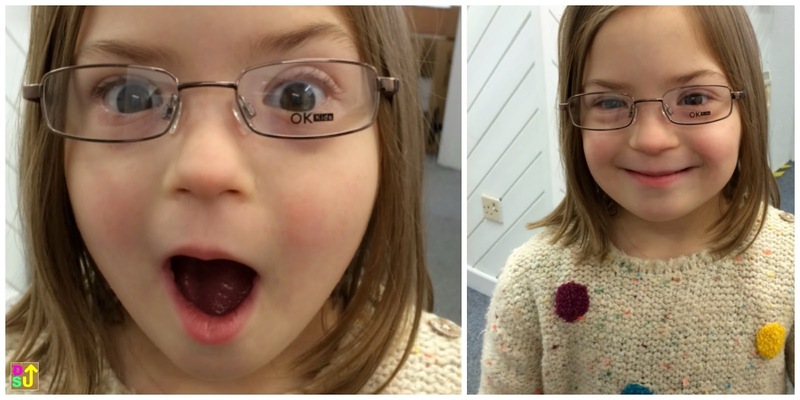 If you are looking for glasses for a child with Down syndrome you might like to start with Erin's World frames available from SPECS4US.com and many UK opticians. They're made with a very small bridge for little noses and are designed to fit around small ears without slipping. They also come in funky colours and are very stylish. We were told Natty doesn't need them as she has a high bridge, but they are my next pair in line if the current pair doesn't do the job. I understand that 2 pairs are wise anyhow. If your optician states that 'frames are being specially manufactured due to patient's facial characteristics, you may be able to claim for the cost of them on your NHS voucher. 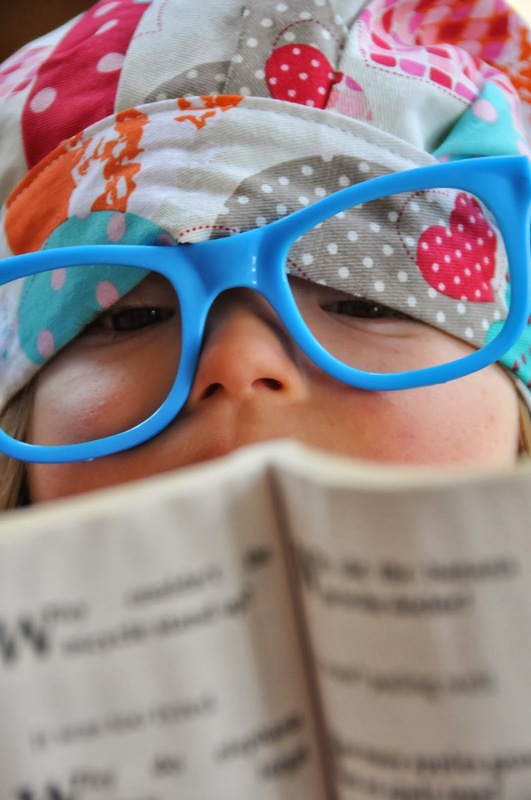 For facts and information by DSMIG about eye conditions in children with Down's syndrome read this informative article by leading DS optometrist Margaret Woodhouse based at Cardiff University Vision in Children with Down's Syndrome. Well how gorgeous is she? Very academic and studious!